This article by Robert Loerzel originally appeared in Pioneer Press on March 1, 2007. Once upon a time, a brash young rock band from England descended on Chicago’s northwest suburbs, smashing guitars and making a loud and rebellious racket. 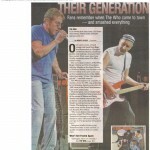 Forty years later, fans vividly remember when The Who came to town. The surviving members of The Who, Roger Daltrey and Pete Townshend, will play Monday at the Sears Centre in Hoffman Estates, but this arena concert isn’t likely to be quite as raucous as their explosive shows of the 1960s, when they sang, “I hope I die before I get old” — and still meant it. The Who’s earliest U.S. concerts included a June 15, 1967, stop at the Cellar in Arlington Heights on and a July 31, 1968, show at the New Place between Cary and Crystal Lake. Paul Sampson, now a Crystal Lake resident, owned the Cellar, a teen club at the corner of Salem and Davis streets that hosted concerts by Chicago bands such as the Shadows of Knight as well as touring acts like Cream. The building is now an auto repair shop, not far from the Arlington Heights Post Office. Sampson recalls thinking that Townshend was “a little spoiled,” a quality common in that era’s rock stars. John Sennett, who now lives in Schaumburg, was a 13-year-old Arlington Heights kid when he went to see The Who that night. As The Who finished their set, as Townshend smashed his guitar. “Their last song was ‘My Generation’ of course, and during the song the little roadie lit some smoke bombs and we all started choking,” Bivans said. “Someone opened the fire doors and we all tried to get out as fast as we could, along with The Who. The band jumped into a waiting black Cadillac limousine and drove away as fast as they could. Sennett said the experience of seeing The Who at the Cellar had a lasting impact on him. 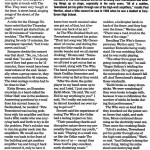 Paul Wertico, an acclaimed jazz drummer who lives in Skokie, was a student at Cary-Grove High School when The Who came back to the area for another concert in July 1968. The Who played in the courtyard of a small club called the New Place, which was in an unincorporated area between Cary and Crystal Lake, on Route 31 less than a mile south of Northwest Highway. After the opening bands finished playing, the audience waited, anxiously wondering where The Who were. Their equipment was onstage, but there was no sign of the band. Recalling The Who’s famous personas, Wertico said, “I remember Entwistle being really staid and just looking out. He was watching Keith and he was really playing. “The other three guys were going completely ape,” he said. “Roger Daltrey’s twirling the microphone. He’s got tape on the microphone so it doesn’t fall off. And Townshend’s doing all those windmills. The Who were so loud that they knocked out the power seven times that night, and each time, Moon continued drumming as the electricity went out. Then came the crushing finale. 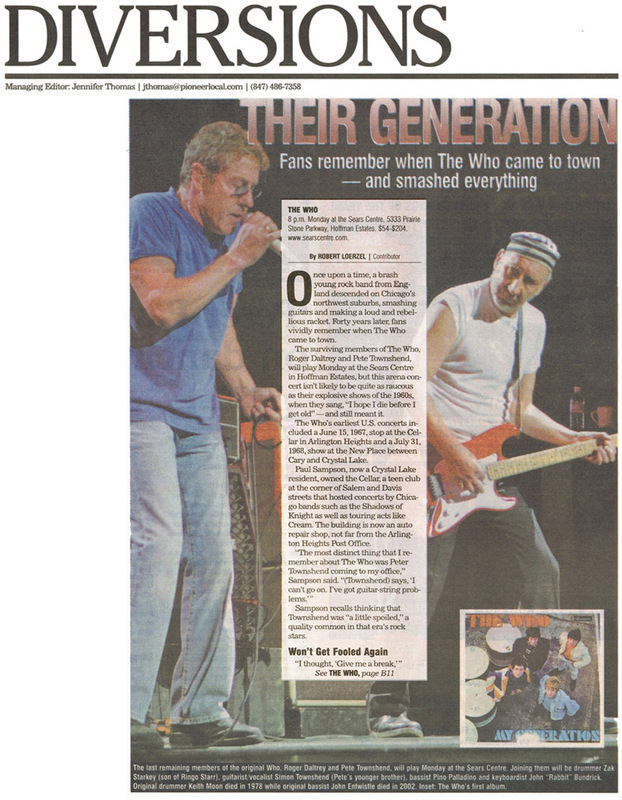 “All of a sudden, Townshend put his guitar through one of the high-watt amplifiers,” Wertico said. “And Daltrey’s doing the same thing, taking his mike stand and destroying stuff. The show left a big impression on Wertico. “The thing that blew my mind was they went through that whole thing of trashing their equipment in a place like that,” he said. “That’s amazing to me. You’d think they’d just save that for the big shows. They did not go on autopilot. They could have been playing for a million people that night.